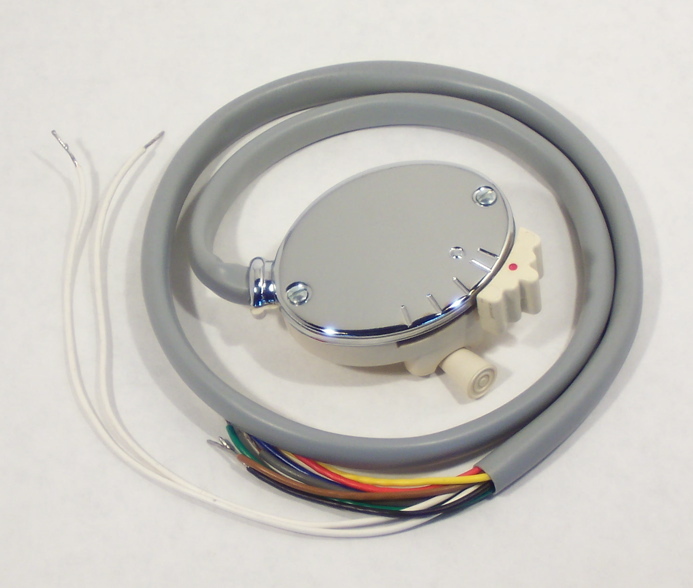 This oval shaped switch fits all D & LD Mk2 models. It is recognizable by the two white wires which go to the horn, which has two terminals. Made in Italy by Tutto Lambretta, this switch is a perfect replica of the original item which was made by G.P.M. While other companies cut corners to save on cost, Tutto Lambretta has gone to great lengths to ensure that their switches are perfect copies of the original, from the correctly painted in red dot on the switch knob, right down to the tiny machine screws that hold on the chrome cover and thread into brass inserts which are cast into the base. In fact, they are such perfect replicas that TL are the only manufacturers in Italy who are authorized by G.P.M. to cast the G.P.M. logo into the underside of the plastic base.